Water meter being installed in Dublin. 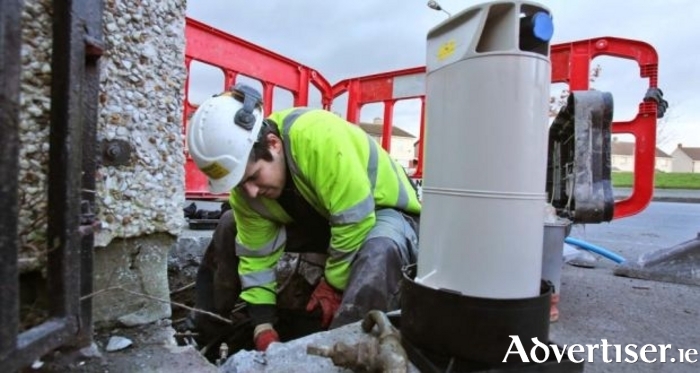 Irish Water will install water meters in Galway city “in the coming weeks”, starting in Knocknacarra. However a local councillor is calling on the controversial company to “continue its practice” of not installing meters “on properties which reject them”. An e-mail sent by Irish Water’s communications manager to elected representatives in Galway announced the roll-out of Irish Water’s Metering Programme. The first area where meters are to be installed is Knocknacarra, and homeowners are due to be sent “detailed information packs on Irish Water and all aspects of the metering programme at least 14 days before metering commences”. A second information pack will be issued to all homes due to receive meters at least two days in advance of metering taking place. Sinn Féin city councillor Mairéad Farrell has accused Irish Water of “springing installations on communities at the last minute in an effort to catch people on the hop who may refuse to allow a water meter be installed on their property”. Nonetheless Cllr Farrell says she hopes Irish Water “will continue its practice in Galway, as it has done in other areas, of agreeing not to install water meters on properties who reject them”. Page generated in 0.1812 seconds.